In San Francisco, prosecutors may be forced to drop as many as 1,400 drug cases  in a growing scandal at the police drug lab. That number includes as many as 400 cases where people have already been convicted and are in drug rehab programs. Some 500 cases have already been dropped, although prosecutors say they may refile charges in some cases when independent testing is done. The lab was shut down March 9 after the department learned of allegations that veteran lab tech Deborah Madden had stolen and used cocaine held as evidence at the lab last year. Now, police are acknowledging that Madden may have stolen other drugs, including Oxycontin. She has yet to be charged. Other lab techs may have been involved in misdoings as well. Defense attorneys have reported the lab saying it had tested drug samples when it appears that the samples remain untouched. Stay tuned on this one. 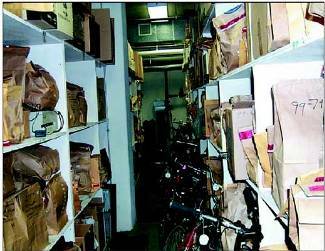 In Lawrenceville, Georgia, drugs have gone missing from the Gwinnett County Police narcotics locker . The theft was discovered March 19 after an audit of the locker. The Gwinnett County Police have asked the Georgia Bureau of Investigation to determine who stole the unspecified amount of drugs. In the past year, only 10 police supervisors have had access to the locker, and currently, only three can get into it. Last year, then narcotics and vice unit supervisor Lt. David Butler was busted for a similar theft from the narcotics locker. In Brownsville, Texas, a former US Customs agent was sentenced Wednesday  to 12 years in prison for taking bribes to allow designated vehicles carrying drugs or illegal immigrants pass through his US port of entry inspection lane in Brownsville. Jose Raul Montano Jr. pleaded guilty to bribery, drug trafficking, and immigrant smuggling charges in November. Prosecutors said he made tens of thousands of dollars in the scheme. In St. Louis, a city jail guard pleaded guilty Tuesday  to a reduced charge after being indicted for smuggling heroin into the jail. Marilyn Denise Brown, 54, pleaded guilty to one count of attempting to possess heroin. Brown admitted meeting an undercover officer and accepting a package she believed contained heroin. She was one of three city jail guards busted in a joint effort by the St. Louis Police and the DEA. The other two have already been convicted and sentenced to prison. Brown admitted meeting an undercover officer and accepting a package she believed contained heroin. In Folsom, California, a Sacramento State Prison guard pleaded guilty Wednesday  to smuggling drugs and cell phones into the prison for inmates. Domingo Garcia, 40, admitted receiving a $1,500 payment from one inmate for bringing him pot and $1,300 from another inmate for bringing him cell phones. He pleaded guilty to three felony counts and faces a one-year jail sentence.